Hazel is supposed to be dead. When she lived before, she didn't do a very good job of it. Sure, she was an obedient daughter, even when her mother was possessed by greed. But that was the problem — when the Voice took over her mother and commanded Hazel to use her "gift" for an evil purpose, Hazel couldn't say no. Now because of her mistake, the future of the world is at risk. Hazel wished she could ride away from it all on the stallion that appears in her dreams. Frank is a klutz. His grandmother says he is descended from heroes and can be anything he wants to be, but he doesn't see it. He doesn't even know who his father is. He keeps hoping Apollo will claim him, because the only thing he is good at is archery — although not good enough to win camp war games. His bulky physique makes him feel like an ox, especially in front of Hazel, his closest friend at camp. He trusts her completely — enough to share the secret he holds close to his heart. Beginning at the "other" camp for half-bloods and extending as far as the land beyond the gods, this breathtaking second installment of the Heroes of Olympus series introduces new demigods, revives fearsome monsters, and features other remarkable creatures, all destined to play a part in the Prophecy of Seven. I'm just going to come right out and say it: I had a lot of fun with The Son of Neptune. I listened to the audiobook and mostly got through it during my commute to and from work. I'll admit that quite often, I found myself laughing out loud, alone in the car. With Percy making his long-awaited return to the folds, the sass was strong with this one and I thoroughly enjoyed myself for the most part. Moving past the characters, it was a treat to get familiar with the other Half-Blood Camp, Camp Jupiter. I've always adored both Greek and Roman Mythology, but I've never really compared the two or thought about which I'd prefer. Now thinking back on when I studied Mythology in Uni, and the way they are presented by Riordan, I'd give a slight edge to Greek Mythology. Romans here are much more the warrior type and their views on some of my favorite gods and goddesses just seemed a bit off. Nonetheless is was fascinating to see the gods and goddesses with different aspects and I though Camp Jupiter had a unique and more elaborate setup compared to Camp Half Blood. Naturally, the book follows the Riordan-established format, with the heroes getting a prophecy, setting off to complete a quest and getting into all kinds of trouble along the way. I don't know if it was my mood, or Riordan's approach, but I found The Son of Neptune to be slightly less repetitive that previous offerings. The pacing seemed tighter and well: Percy and his sass were EVERYTHING. As much as I am enjoying all of the new characters, Percy is, and always will be the best thing about this series. Ever. Having him back in action, older, more mature but still as sarcastic and charming as ever pretty much made this book for me. Needless to say, I am completely ready to jump straight into The Mark of Athena! I remember being frustrated with the memory loss thing too, but I was also really glad to have Percy back. It took me a bit to warm up to Hazel and Frank as well, but I got there in the end. I think the next one, Mark of Athena, is my favorite of the series. Great review! Oh having Percy back was THE BEST THING. And honestly it just took the time to get to know Frank and Hazel to warm up to them :) I actually *just* started Mark of Athena late this week so I can't wait to compare notes with you! I'm glad it wasn't just me^^ The memory issue was ok in the first book, but it started to get old here...especially since it was our old favorite Percy :D I was in a bigger rush to skip Hazel and Frank's chapters at first, but once I warmed up to them it was ok. I wasn't sure about the alternating POVs either but once you know and like all of the characters, I find it quite fun! Though Percy's chapters are naturally always the best XD I live for his sass! I've already dived into Mark of Athena and thinking I'll just marathon the series until I'm done haha! The memory loss was a huge frustration of mine too, but it's so feels so satisfactory when he completely gets his memory back in upcoming books. I hope you enjoy the next one! 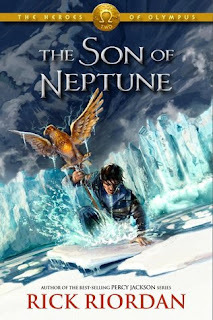 I love Son of Neptune a lot more than the first book. Maybe it's because Percy's back?? The book did feel more fun in general and the quest too was pretty cool. This book also really set the tone for the rest of the series. I think it's my favorite in the series actually! I did too and I'm certain that Percy has A LOT to do with that LOL! It was more fun, even without the added familiarity of Percy - I loved it a whole lot. Oh it's your favorite? I'm planning on marathoning the entire series back to back (already started Mark of Athena) so we'll have to compare notes once I'm all caught up! I was the same way Micheline! I wanted Percy all the time. Haha. I did like Piper, Jason, and Leo a bit more than Hazel and Frank though. I really liked Mark of Athena so I hope you do too! LOL totally - I mean the other characters grew on me (especially Leo haha) but at first when you know them less, it was like: GIMME PERCY DAMMIT! So far so good with The Mark of Athena but I'm only like 25% in!